This article is about the block from Thaumcraft 4. You may be looking for Silverwood Leaves from Thaumcraft 3. Silverwood Leaves is a block added by the Thaumcraft 4 mod. Can be obtained by breaking the block with Shears. Can drop Silverwood Sapling when broken. Drop chance can be increased by using Fortune enchantment. 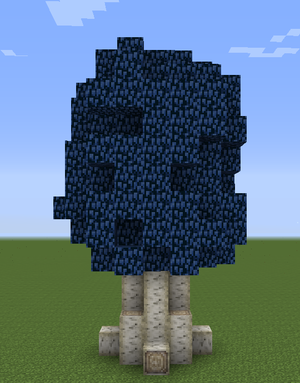 These large and majestic trees can be found dotted all over the countryside. Their wood is able to absorb impressive amounts of magic making it a popular component in the crafting of magical devices. These rare and magical trees are a wondrous sight. Their leaves shimmer with magical energy and their pale, soft wood is valued for its purifying properties. The trees magical nature is such that aura nodes often form within their hearts - this feature alone makes a silverwood sapling a prize beyond measure. The strange, glowing flowers only grow in the shadow of Silverwood Trees. They can be harvested and pulped to produce quicksilver. Found only in the hottest of climes, these plants burn with elemental fire. They can be harvested and ground to produce a fine powder akin to Blaze powder. This strange, pod like plant is only found growing on trees in magical forests. They grow very slowly and when harvested usually only yield one or two beans. These beans, known as Mana Beans, contain concentrated amounts of essentia. They can also be consumed, though the results are often a bit unpredictable. They can be replanted, but cultivation is difficult and time-consuming. Wild mana pods usually only produce primal aspects, though it is said that planting beans adjacent to existing ones sometimes result in beans with compound aspects." This page was last modified on 10 September 2016, at 19:09.